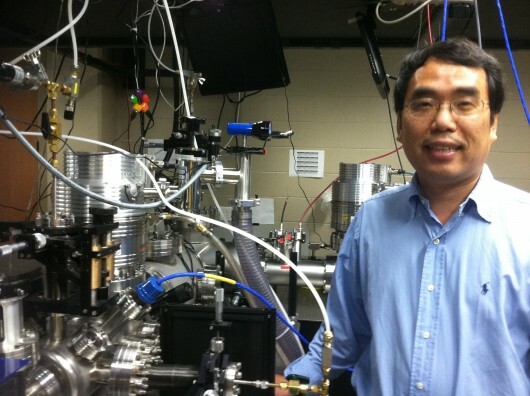 University of Central Florida physicist Zenghu Chang has done it again. For a third time this year, his research group has published an article in a Nature journal. This time, Chang and his team have developed a new ultrafast light source for observing electron motion in molecules – made up of nuclei and electrons – at the point before the nuclei start to move. By being able to observe what actually happens, scientists can begin to understand how an electron interacts with other electrons, which may help improve the efficiency of solar cells. Being able to see this superfast interaction between electrons gives scientists another tool to unlock the rules that govern the quantum-mechanics world – a world where microscopic objects don’t obey the laws of physics we have come to rely on for understanding in the macro world. So how did Chang and his team manage to develop the new light source? The team borrowed an idea from Chang’s earlier innovative work in the area of ultrafast lasers. The result of his study “Coherent phase-matched VUV generation by field-controlled bound states” appears this week in Nature Photonics. Chang has been studying light and ultrafast lasers his entire career. This past year UCF established the Institute for the Frontier of Attosecond Science and Technology (FAST). The institute is a collaboration between experts and students in UCF’s College of Optics and Photonics (CREOL) and the College of Sciences’ physics department to focus on this field of science. Chang has a joint appointment in CREOL. Co-authors include: Michael Chini, Xiaowei Wang, Yan Cheng, Yi Wu and Eric Cunningham from UCF’s FAST; Peng-Cheng Li, John Heslar and Shih-I Chu from the Center for Quantum Science and Engineering and the Department of Physics at the National Taiwan University; He Wang from the Materials Sciences Division at the Lawrence Berkeley National Laboratory, and Dmitry A. Telnovfrom the Department of Physics at St. Petersburg State University in Russia. Chang said he is excited about the new work because he hopes it will help lead to bigger and greater discoveries. To see other 2014 Nature Photonics articles click here and here . The Defense Advanced Research Projects Agency, National Science Foundation, U.S. Department of Energy, National Science Council of Taiwan and National Taiwan University funded the research.